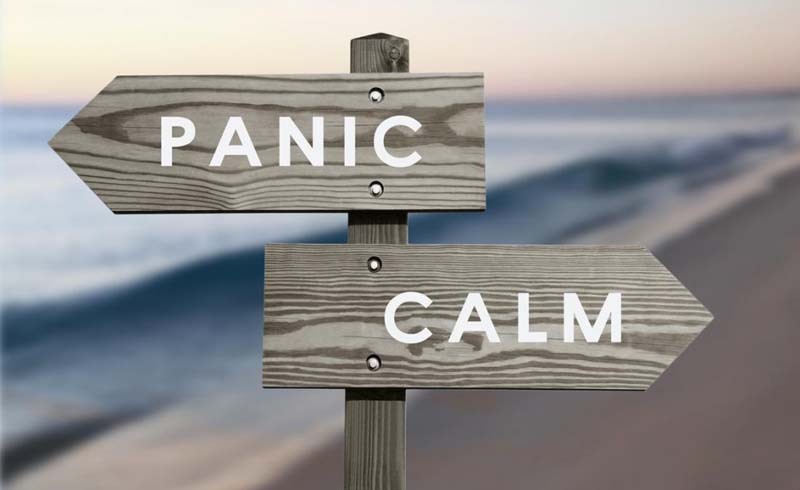 “A panic attack throws you into physiological distress because your brain believes you are in need of protection (aka in fight or flight mode),” Dr. Forshee tells us. “So one of the most effective strategies is to engage in diaphragmatic breathing.” That’s because when you’re experiencing a panic attack, your body tenses up and you tend to hyperventilate, taking short, quick breaths from your chest. “This type of breathing sends a signal to your brain that you are in distress, perpetuating the physiological escalation and by proxy, the panic attack.” Breathing through your diaphragm, on the other hand, sends a signal to your brain that you are safe and relaxed, which calms your physiology down and lets your body know that it no longer needs to be in hyper drive. “When someone is experiencing a panic attack, their mind is telling them that they are afraid of something,” says Dr. Forshee. “Rather than allowing your thoughts to perpetuate down that negative spiral, it’s important to tell yourself the opposite.” In other words, it’s all about restructuring your thoughts. So, instead of telling yourself that the bad thing will happen, try asking yourself, “what if that bad thing doesn’t happen?” (Easier said than done, we know.) It’s also helpful to remind yourself that all panic attacks end and that you just have to ride this one out. Be wary of avoidant behavior.